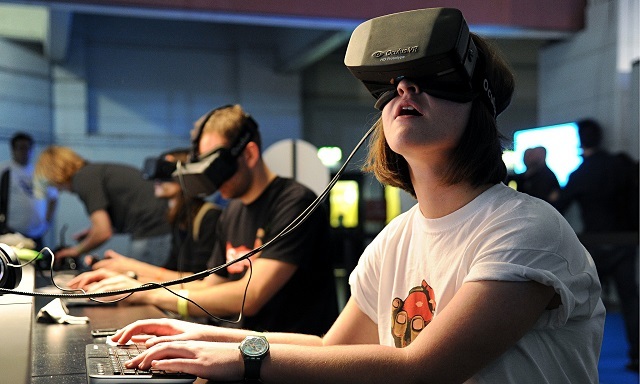 Virtual reality meets social media: what is Facebook’s endgame? With Facebook’s acquisition of Oculus, the creators of the Oculus Rift Virtual Reality Headset, the general consensus is that Virtual Reality is about to be “the next big thing”. Major companies are starting to investigate the Oculus rift and ensure that when the wave breaks they won’t be caught unawares. Google is even reported to be working on a virtual-reality version of the Android OS. But what is far less clear, is exactly what form mainstream virtual-reality will take, and how precisely Facebook will drive mass adoption of the platform, let alone monetize it. The Oculus Rift was originally aimed at mainstream video gamers, who were none too pleased to see their gaming platform co-opted by a company whose principal revenues are driven by advertising and metrics. Mark Zuckerberg was quoted at the acquisition announcement as saying “This is just the start. After games, we’re going to make Oculus a platform for many other experiences. Imagine enjoying a court side seat at a game, studying in a classroom of students and teachers all over the world or consulting with a doctor face-to-face — just by putting on goggles in your home. This is really a new communication platform”. But communicating what, precisely? And here is where it gets interesting, because most people don’t realize is that a Virtual Reality headset is more than just a display. It is a metric-mining machine: head tracking, eye tracking, focus of attention – it knows where you’re looking, what draws your attention and how you react. Facebook has an impressive ability to understand people based simply on their likes and dislikes, as Ross Dawson already noted in an interview earlier this year. Virtual reality measures “everything they wish they could gather in the real world” as musician Peter Berkman noted in his personal blog. In the context of teleconferences, immersive video games and interactive consumer experiences, Virtual Reality is effectively omniscient when it comes to measuring the smallest actions and reactions of each individual user. Link that to their Facebook profile and you are talking about a metrics system that can predict your actions better than you do. And if these virtual “common spaces” and video games have advertising – and they almost certainly will – then you have the most powerful attention metric diviner you can have outside of a lab. Every glance at a virtual billboard, every passing look at a product placement, it’s all there for the system to capture. In a matter of moments, the system can divine what you are more or less likely to look at and adjust the content advertised appropriately. Because virtual reality is nothing if not reactive. None of these plans will mean much, however, if the Oculus Rift user base fails to achieve significant critical mass. It is probable that Facebook will choose to take a long road towards ultimately monetising its investment in Virtual Reality, and that their priority for the next five years will be to be to drive adoption and creation of content until it achieves a critical mass sufficient to break out of gaming and into the mainstream. In the meantime, virtual reality remains something of a prestige game for big business – a way for them to flex their financial muscles and demonstrate relevance, but not an immediate concern. But no-one wants to be the one caught off-balance when the virtual reality revolution begins.